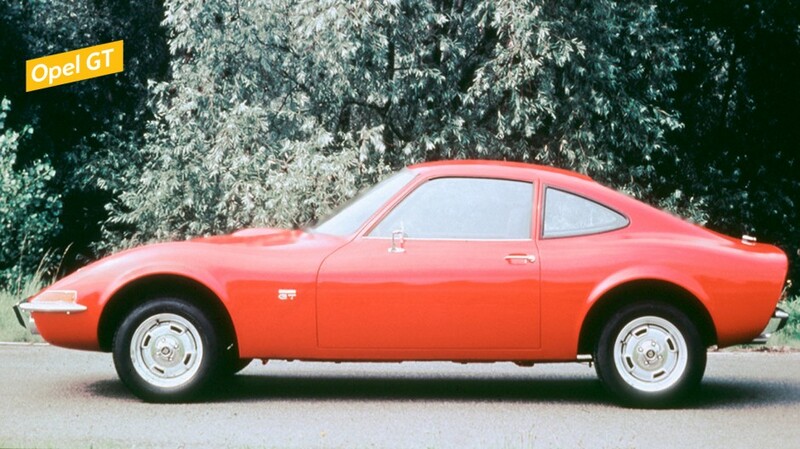 Designers call the Opel GT’s form the “Coke-bottle shape”. The legendary two-seater revolutionized the world of sport coupés with a host of unusual design and structural elements. The two-door model had low, tapered frontal styling, its rear was defined by shapely curves, and its massive wheel-arches and slim waist earned it that comparison to a Coke bottle. The GT was designed by Erhard Schnell, who had already created the concept car in 1965, the Experimental GT. 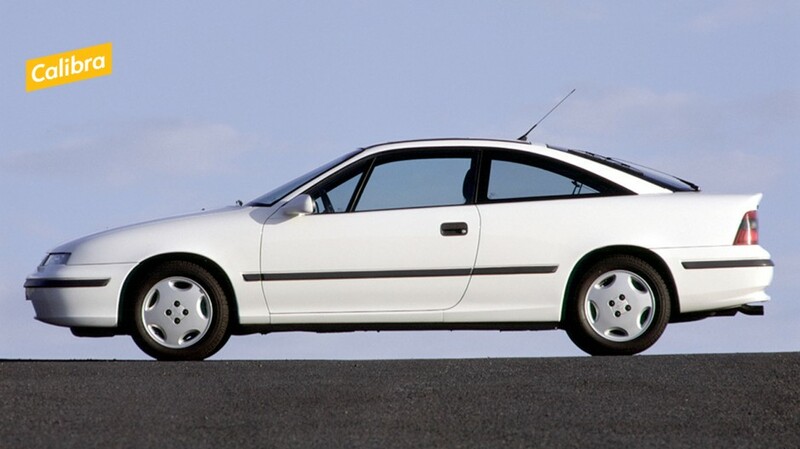 And Schnell, who went on to design the Corsa A and successful Calibra, had taken the GT from concept to series production in just three years without allowing the distinctive character of the design to get lost in the process. The pop-up headlamps became a reality, as was the idea to forgo a rear luggage compartment. Only the small space behind the seats was designated for stowage. “Only flying is better” the ads promised GT drivers; and indeed, the sportive Opel was not only praised by normal customers, but also by racing drivers. Especially when equipped with the powerful 1.9-liter four-cylinder engine from the Rekord C, the GT – which weighed considerably less than one ton – delivered formidable performance. The 90 hp engine enabled a top speed of 185 km/h, exceptionally fast for the time. Despite its sporty genes, the GT pampered its occupants. The doors were cut well into the roof and allowed comfortable entry and egress. In the early days of the miniskirt, this was a particularly compelling design detail. Opel presented the second generation of its luxury sedan model range KAD (Kapitän, Admiral, Diplomat) at the Geneva Motor Show in 1969. The Admiral was again the mid-level offering in the line-up. Compared to the previous model, the body was 4.8 cm shorter and 5.0 cm narrower, which is why the Opel press kit certified that the 4.91 m long car had compact exterior dimensions. Yet the new Admiral, with its smooth, uncluttered design, as well as its characteristic, horizontal light units, had a greater road presence than its predecessor. Echoes of American styling were still noticeable. Opel placed great value on comfort in its top model range. “The interior exudes the coziness of a tastefully decorated living room,” the press material of the time boasted. Comfort levels could be further enhanced with air conditioning and a stereo radio/tape player. Engineers also focused on safety, with body deformation zones, a stable passenger cell, safety steering column and disk brakes. With its sophisticated De Dion rear axle, a 165 hp, 2.8-liter six-cylinder engine with electronically- controlled fuel injection and, optionally, hydropneumatic ride-height leveling as well as threespeed automatic transmission, the Admiral reflected Opel’s high technical standards. “When designers dream of their work, they dream of the future of the automobile.” This quote from Opel designer George Gallion is particularly apt for the Manta A. Introduced in 1969, this sporty two-door model was launched in 1970, two months before the four-door Ascona A with which it shared a chassis and drivetrain. Gallion, deputy chief of exterior design at Opel, had little time to design the Manta, which was Opel’s response to the Ford Capri. 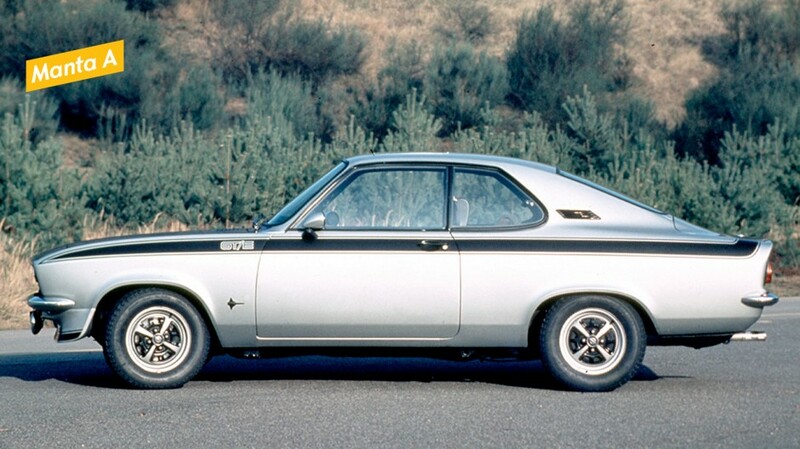 “My boss at the time, Chuck Jordan, gave me the job of developing a competitor to the Capri,” he says. “Chuck left for vacation with the words ‘have it finished by the time I’m back, otherwise I’ll show you how it’s done’”. The Manta is defined by a clean, crisp design in the style of highly desirable Italian sports coupés. Frameless windows, a crisp rear and a clearly structured front end quickly turned it into an affordable dream car for the younger generation. Its reasonable price was also a result of using the Ascona body platform and existing parts. “For example, there was no time to develop our own indicator units and headlamps, so we looked around to see what would fit and simply took the headlamps from the Olympia, which had just been phased out,” says Gallion. Today, the Manta has become a cult car, mainly due to its clean shape. At classic car gatherings like the popular vintage car weekend at the historic Opel Villas in Rüsselsheim, the Manta is one of the most admired exhibits, next to the GT. 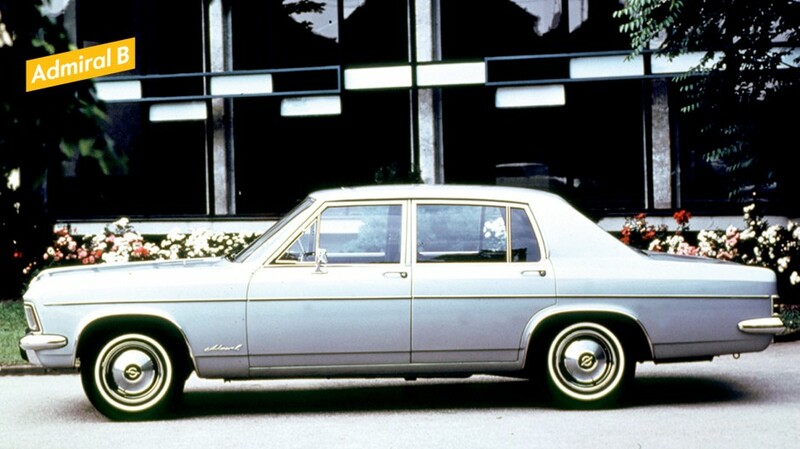 For Opel, the Manta model line was one of the most successful product developments in the company’s history. Over one million units were sold from 1970 to 1988. Cars grow. In small but inevitable steps, the small Kadett became a veritable compact car. This created space for innovation. 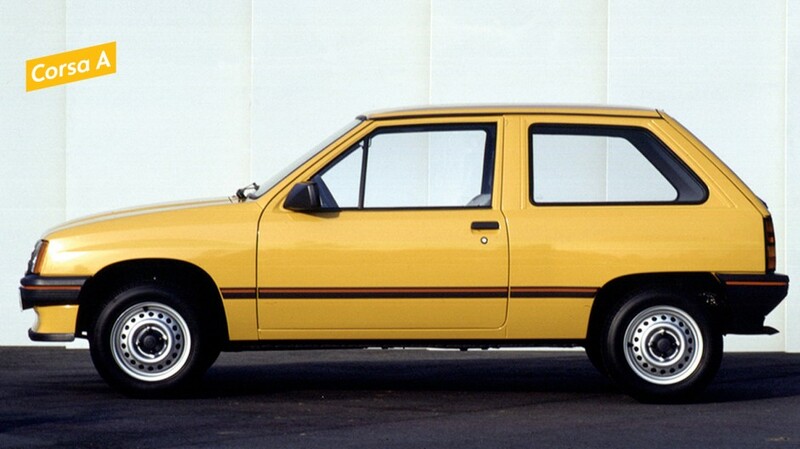 In 1982, the time was ripe, the Opel Corsa was on the starting blocks. Just 3.60 meters long and thus clearly a small car, the three or five-door hatchback was able to boast a potentially record-breaking drag coefficient for its class, just 0.36. To ensure that Opel’s youngest family member had a solid stance on the road despite its size, Erhard Schnell, responsible for the model line, gave it flaring wheel-arches. These not only contributed to improved aerodynamics, they also gave the Corsa an extremely “grown-up” and robust stature. Large window surfaces for optimum visibility and a very subtle wedge shape were the main characteristics of Opel’s smallest car. In some markets, it was even offered as a notchback with a separate luggage compartment. Airflow was directed upwards by the flattened shape of the hood, allowing for superb aerodynamic characteristics. 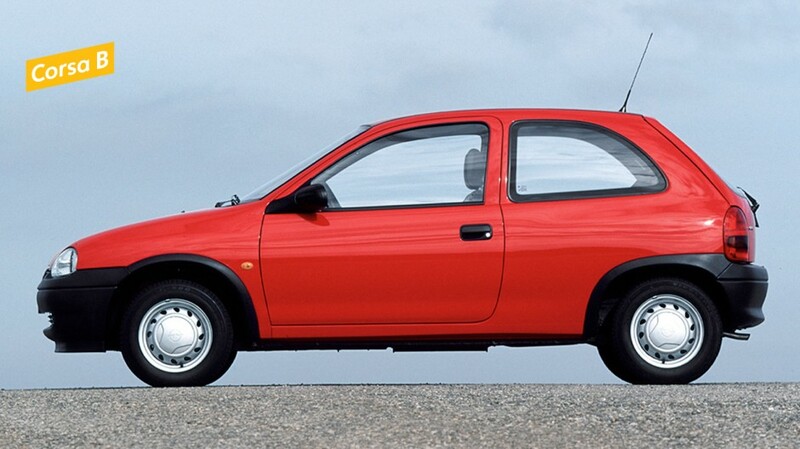 Wearing hats was still in vogue at the time: “The small Corsa is also big with its high roof,” press information of the time stated. “Corsa passengers only have to take off their hats when greeting someone.” Erhard Schnell wanted to give the Corsa a masculine form, so its striking design was distinguished by the use of right angles and clear lines. All this was to counteract the prevailing image of a small car. And with a luggage compartment volume of 225 to 845 liters, the small Opel was ideally equipped to deal with major shopping expeditions. Opel presented the Omega in 1986 as the successor to the successful Rekord model range. The company had invested more than DM2 billion (€1.02 billion) in the development of this new mid-size vehicle, and the result was convincing both visually and technically. Thanks to the experience the Opel design team and the aerodynamics specialists already had in 1981 with their Tech1 study – which closely anticipated the form of the Omega – the new sedan stood out with the lowest drag coefficient in its class: 0.28. The most important contributing element was the fact that the outline of the vehicle had the shape of a droplet. Groundbreaking technical design solutions, such as flexible joint seals, smooth and flush glazing with a specialized guidance system for the side windows, and the recessed door handles and windshield wipers also all played their part. The recessed wipers, together with the car’s rounded front section which deformed on impact, also reduced the risk of injury to pedestrians or cyclists in the event of a collision. In addition to excellent aerodynamics, a new generation of lower emission 1.8 and 2.0-liter four-cylinder engines contributed to the Opel Omega’s low fuel consumption, with Euromix figures ranging from 6.4 to 8.4 l/100 km. Innovative solutions were also implemented in the design of the cockpit. Newly developed, easily legible LCD instruments were an optional extra. In 1984, Opel designers and engineers once again set standards with the Kadett E. At the heart of its development was the goal of significantly increasing economic efficiency compared to its predecessor. The aim was a reduction in air drag without exceeding the compact exterior dimensions of the Kadett D. After 1,200 hours in the wind tunnel, the development team was able to announce “mission completed”. Without any functional disadvantages, such as rapid heat build-up in the cabin due to the steeply raked windshield, the Kadett E achieved a drag coefficient of 0.32. This was bettered only by the sportiest model variant, the Kadett E GSi, with a value of 0.30, which gave the near four-meter long, wedge-shaped five-seater the lowest aerodynamic drag for any series production model in the world. Viewed from above, the Kadett GSi has contours similar to that of a droplet, which in aerodynamic terms means they are ideal for air flow optimization. This inspired Opel’s press department to claim that with the front of the car measuring 1.9 square meters, the Kadett GSi offers no more resistance to air flow than a board measuring half a square meter – such as grandmother’s cake tray. A key contributor to the great success of the Kadett E, of which 3.8 million units were built over nine years, was the comprehensive model line-up. There was a choice of seven body variants: three and five-door hatchbacks, three and five-door station wagons, a panel van, a notchback, and an elegant convertible. “Enough of the machismo” was the watchword when the second Corsa generation replaced its predecessor in 1993. Sharp edges and creases were replaced by soft curves and flat surfaces. Hideo Kodama sketched the Corsa B shape. “Back then, we wanted to design a woman’s car. Today, you can’t even say that, because it’s regarded as discriminating. But in those days it was different,” he says, while explaining the design task for the second Corsa generation. Indeed, more than 60 percent of customers who bought a Corsa A were women. The softer design of the second generation was therefore an acknowledgement of this reality. The slim roof pillars gave the impression that the roof was floating over the cabin. This idea had first been presented to the public in the Opel Junior concept car, shown at the Frankfurt Motor Show (IAA) in 1983. “The Corsa B was really a clean cut in the design history of the model line,” says Kodama today. “We were able to realize a substantially better space concept on a wheelbase which was 10 centimeters longer than the previous one.” There was enough space for five passengers and plenty of luggage. “The windshield was positioned further up front at a considerably flatter angle so that we had more leeway in the design of the interior,” explains Kodama. Today, the Corsa is a long-established favorite with the public. It is one of the most popular small cars in Germany, and over 11.7 million units have been sold in Europe alone during the first 32 years of its lifespan. When asked if the computer was increasingly important for his work, Opel designer Erhard Schnell simply replied: “The computer cannot be creative.” He said he needs to have a pencil in his hand to put his thoughts down on paper. And that is exactly what he did when he gave the Opel Calibra its unmistakable shape in the late 1980s. This slim, highly-tapered sports coupé marked a milestone in Opel’s design history. With a drag coefficient of just 0.26, it was the most streamlined series production car in the world when it was launched in 1989. And well ahead of the times. 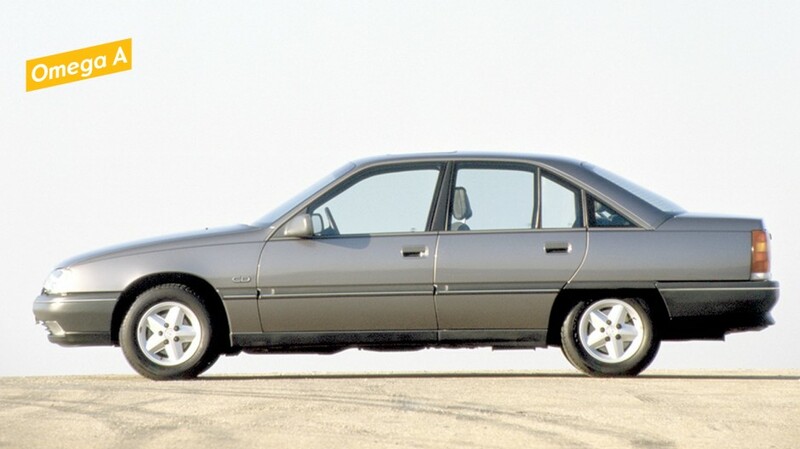 The sleek, sporty shape was created around Vectra A underpinnings, yet the connection was not apparent in any part of its masterfully-tailored bodywork. Stretched with rounded shapes, it probably had the slimmest headlamps that existed before the arrival of xenon, LED and laser lights. The Calibra was the natural successor to the Manta. And just like its predecessor, the Calibra was based on a sedan in the same segment and, again in common with the Manta, it soon achieved cult car status through the seductive appeal of its emotional, dynamic form. This was reason enough for the readers of the German motoring magazine Auto Zeitung to name it sports coupé of the year. In early 1991, they chose the Calibra over competitors from Stuttgart and Munich as the sports car with the best design under the title “Shapely Aerodynamic Wonder”. Even years later, Schnell said of the Calibra’s character: “I myself find the rounded form more pleasant, it is more substantial. Too many knuckle lines can give a look of slight instability”. 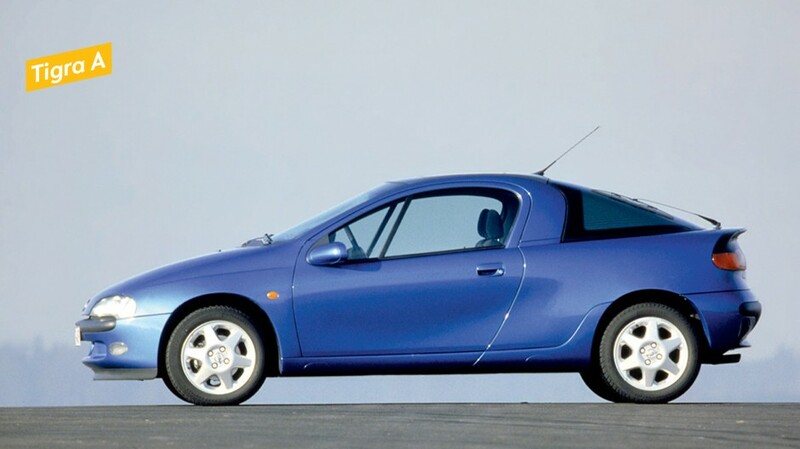 The Japanese Opel designer Hideo Kodama developed the shape of the Tigra compact sport coupé, based on the Corsa B. In contrast to the Corsa, this 2+2 seater is distinguished by pronounced B-pillars, a hood with striking creases and a dome-shaped glass roof over the rear. “It’s not only the strict application of pure reason that counts in a coupé,” according to a product text describing this two-door model less than four meters long. “Here emotions are allowed, and indeed welcome.” The tinted Sundym glass in the rear, developed in America, lowers cabin temperature by four to five degrees, fulfilling not only aesthetic but also functional demands. The interior is versatile, a rare feature in coupés at that time. Kodama explains the car’s functionality: “Whoever drives a small car does so because of the low price or because it’s easier to find a parking space in the city. So the car isn’t just an attractive way to be mobile and enjoy driving, it’s also a mode of transportation.” So nothing gets left at home, the Tigra’s luggage compartment is flexible, with a foldable rear seatback. Kodama contrasted soft and hard design elements in the Tigra. Soft curves are in stark contrast to its distinctive wedge shape, and the sharp creases in the hood create a counterpoint to the soft outlines of the air intake vents in the front bumper. Production of this agile Opel coupé began in 1994 and ended in 2001. 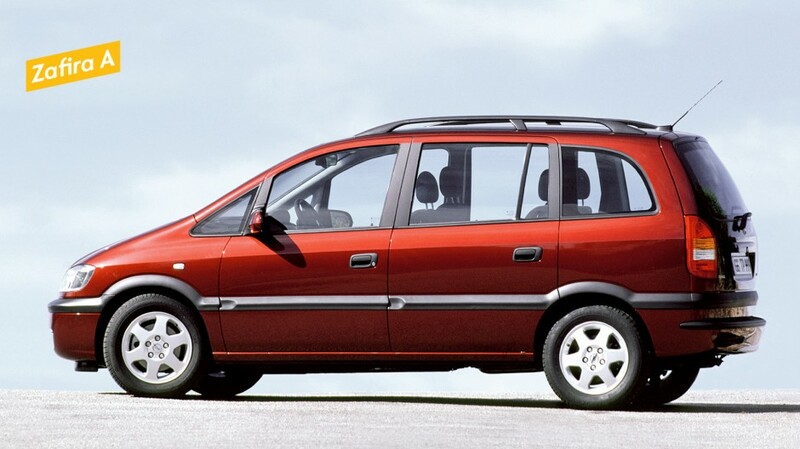 On April 16, 1999, a real trendsetter was launched in the shape of the Opel Zafira. This successor to the Sintra was based on the Astra and impressed with its crisp styling and technically-oriented design, demonstrating the concept of the compact van – high functionality and versatility, together with a generous feeling of space. What made the Zafira unique was its innovative Flex7 seating system, which enabled this compact seven-seater to be transformed easily into a two-seater with 1,700 liters of load space – all without any seats having to be removed. The single seats in the third row could be folded down, thanks to a sophisticated mechanism, and stowed in floor recesses, giving a flat and even load deck. If additional cargo volume was needed, the second row of seats could also be folded, slid forwards and fixed behind the front seats. The Zafira was much more than simply a load carrier. It also impressed with its passenger car-like driving qualities, thanks to its newly-adjusted DSA (Dynamic SAfety) chassis. The Zafira boasted the best drag coefficient in its class at 0.33, and had a curb weight of just 1,390 kilograms, significantly lower than any comparable family van. Class-leading aerodynamics and low weight also contributed to the Zafira’s impressive fuel economy – with a 100 hp, entry-level engine, it consumed just 8.3 l/100 km. In March 2001, Opel entered new terrain with its Speedster. This open-top, two-seater was the first mid-engined car to carry the Opel blitz badge. It was also the first Opel series production vehicle built from aluminum and plastic materials. 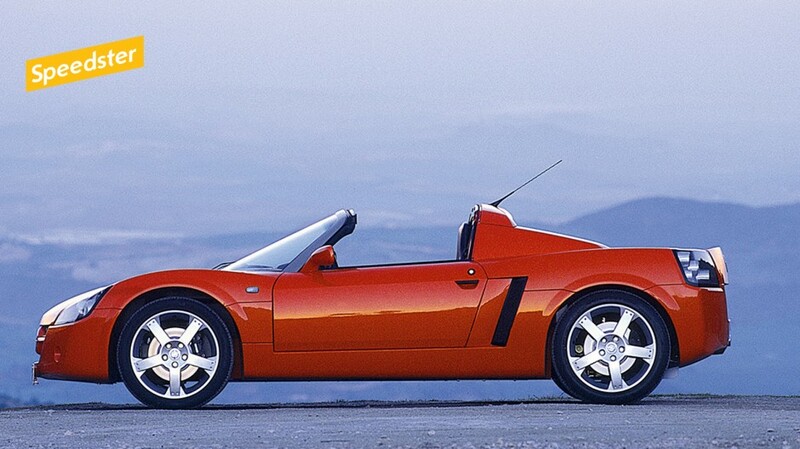 This attractive sports car was just 3.79 m long and 1.12 m high, and was based on the concept of the Lotus Elise. 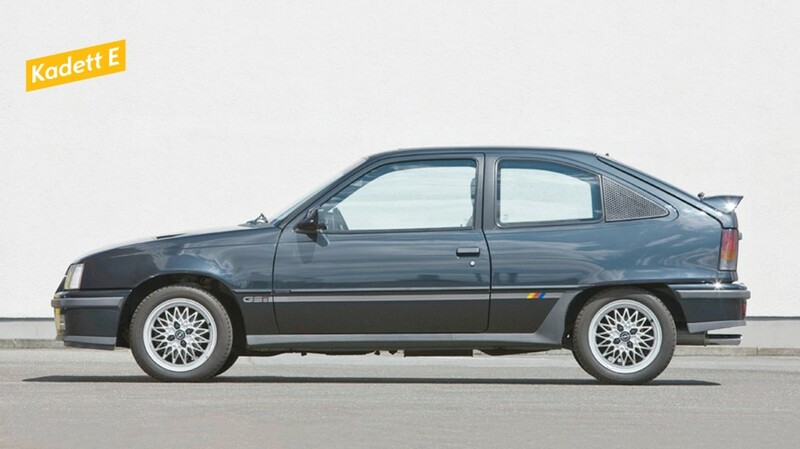 But it was immediately recognizable as an Opel. As Opel’s then head of design, Hans Seer, explained: “For the first time, the lightweight body incorporates the same technically-oriented design language which we showed with the G90 and Zafira Snowtrecker studies in a series production model.“ The Speedster design team used opportunities provided by plastic material to create radical edges, which would have been extremely complex to shape in steel. Aluminum, which forms the structure of the Speedster, also comes to the fore in the no-frills cabin. Powered by the 147 hp 2.2-liter ECOTEC engine from the Astra coupé, the 945 kg Speedster reached 100 km/h in just 5.9 seconds. Even more performance was available with the Speedster 2.0 Turbo, launched in 2003, which sprinted from zero to 100 km/h in just 4.9 seconds and achieved a top speed of 243 km/h. In a comparison test carried out by Car, a leading UK motoring magazine, the Opel Speedster 2003 swept the board against 38 top sports cars, securing the title “Performance Car of the Year”. The most exciting Opel Astra ever made its world premiere at the Frankfurt Motor Show in the fall of 2011 – the GTC had arrived. The Gran Turismo Compact impressed with its emotional interpretation of Opel’s new design philosophy. With its sporty silhouette, featuring a boldly arched, lower roof line, dynamic proportions and striking tapering front and rear, its shape is reminiscent of a wild cat crouching down, ready to leap. 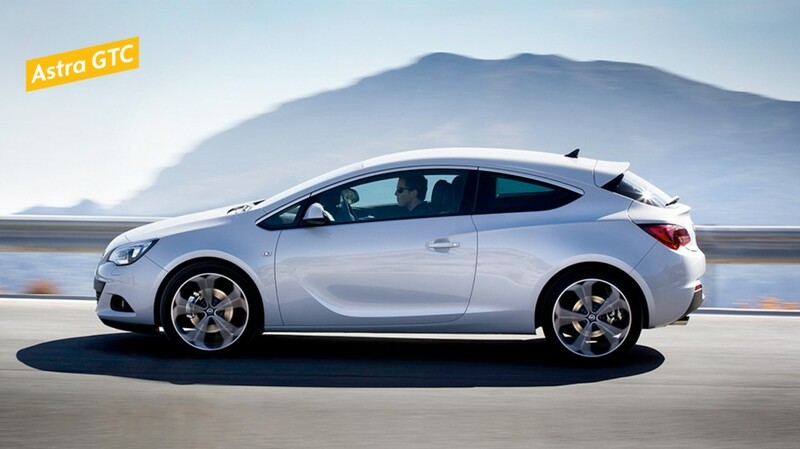 This effect is emphasized by a lower chassis, which makes the Astra GTC lower on the asphalt than its Astra kin. The optional panorama windshield was another highlight. This new concept made from Solar Protect Glass stretches right back to the B-pillars, offering a novel visual and spatial experience, comparable only to the cockpit canopy of an aircraft. A clever, seamlessly adjustable shading system protects occupants from strong sunlight. Indeed, no concessions at all need to be made in terms of interior comfort. Although the rear side windows are drawn in tightly, adults can also travel comfortably in the back. „Coke-Bottle-Shape“ heißt es unter Designern, wenn die Form des Opel GT beschrieben wird. Der legendäre Zweisitzer revolutionierte die Welt der Sportcoupés mit einer ganzen Reihe von ungewöhnlichen Gestaltungs- und Konstruktionsmerkmalen. Der Zweitürer war flach, sein Heck von formschönen Rundungen geprägt, die wuchtigen Radhäuser und die schlanke Taille brachten ihm den Vergleich mit der Cola-Flasche ein. Gezeichnet hat den GT wie bereits die Studie Experimental GT von 1965 Erhard Schnell. Der höchst kreative Designer hat den GT in nur drei Jahren zum Serienmodell weiterentwickelt. Dabei blieben die Eigenheiten des Designs nicht auf der Strecke. Die Klappscheinwerfer wurden ebenso umgesetzt wie das Konzept, das keinen Kofferraum vorsah. „Nur Fliegen ist schöner“ versprach die Anzeigenwerbung der damaligen Tage dem GT-Fahrer, und tatsächlich wurde der sportliche Opel nicht nur von normalen Kunden, sondern auch von Motorsportlern gelobt. Besonders mit dem kräftigen 1,9-Liter-Vierzylinder aus dem Rekord C brachte es der deutlich weniger als eine Tonne wiegende GT auf beachtliche Fahrleistungen. 90 PS reichten für 185 km/h Spitze, ein für damalige Verhältnisse äußerst rasantes Tempo. Trotz der sportlichen Gene verwöhnte der GT mit Komfort. Die weit in das Dach hineingezogenen Türen erlaubten ein bequemes Ein- und Aussteigen, das auch von weniger talentierten Akrobaten gemeistert werden konnte. In den beginnenden Zeiten des Minirocks ein durchaus überzeugender Umstand. Auf dem Genfer Automobilsalon präsentierte Opel 1969 die zweite Auflage seiner Luxuslimousinen-Baureihe KAD (Kapitän, Admiral, Diplomat) der Weltöffentlichkeit. Der Admiral stellte dabei wieder die mittlere Ausstattungslinie der Baureihe dar. Gegenüber dem Vorgänger war die Karosserie 4,8 Zentimeter kürzer und 5,0 Zentimeter schmaler geworden, weshalb die Opel-Pressemappe dem 4,91 Meter langen Wagen kompakte Außenabmessungen attestierte. Dabei wirkte der neue Admiral mit seiner ruhigen und klaren Linienführung sowie den charakteristischen waagrechten Scheinwerfern und Heckleuchten noch präsenter auf der Straße als das bisherige Modell. Wobei Anklänge an das seinerzeitige US-amerikanische Autostyling unübersehbar waren. Großen Wert legte Opel bei seiner Spitzenbaureihe auf den Komfort: „Das Wageninnere strahlt die Behaglichkeit eines mit Geschmack eingerichteten Wohnraumes aus.“ Dieses Wohlbefinden ließ sich durch Klimaanlage und Radio mit Stereo-Tonbandgerät weiter steigern. Und auch die Sicherheit stand mit Knautschzonen, stabiler Fahrgastzelle, Sicherheitslenksäule und Scheibenbremsen im Fokus der Entwickler. Mit seiner aufwändigen De-Dion- Hinterachse, einem 165 PS starken 2,8-Liter-Sechszylinder mit elektronisch gesteuerter Benzineinspritzung und – auf Wunsch –hydropneumatischer Niveauregulierung nebst Dreigang-Automatikgetriebe markierte der Admiral auch technisch den hohen Anspruch von Opel. „Wenn Designer von der Arbeit träumen, dann von der Zukunft des Automobils.“ Dieses Zitat des Opel-Designers George Gallion beschreibt den Manta A gut. 1969 vorgestellt, kam der sportliche Zweitürer 1970 auf den Markt, zwei Monate vor der viertürigen Limousine Ascona A, mit der er das Chassis und den Antriebsstrang gemein hat. Dabei hatte Gallion, der stellvertretende Leiter des Exterieur-Designs, den Manta in kürzester Zeit als Antwort auf den Ford Capri gestalten müssen: „Von meinem damaligen Chef Chuck Jordan bekam ich den Auftrag, einen Wettbewerber zum Capri zu entwickeln. Und Chuck verabschiedete sich in die Ferien mit den Worten: Wenn ich wieder da bin, seid ihr fertig, sonst zeige ich euch, wie das geht“. Der Manta ist in Anlehnung an die begehrten Sportcoupés aus Italien von einem sauberen, geradlinigen Design geprägt. Rahmenlose Fenster, ein knackiges Heck und eine klar strukturierte Front haben ihn schnell zum erschwinglichen Traumauto der jüngeren Generation gemacht. Sein günstiger Preis resultierte nicht zuletzt aus dem Zugriff auf die Bodengruppe des Ascona und dem Einsatz von vorhandenen Bauteilen. „Für die Entwicklung eigener Blinker und Scheinwerfer zum Beispiel war keine Zeit, da haben wir geschaut, was passt, und einfach die Scheinwerfer des gerade ausgelaufenen Olympia genommen“, sagt George Gallion. Heute ist der Manta gerade wegen seiner sauberen Form zum Kultauto geworden. Bei Klassiker-Treffen wie dem höchst beliebten Oldtimer-Wochenende an den historischen Opelvillen in Rüsselsheim zählt der Manta neben dem GT zu den am meisten bewunderten Exponaten. Für Opel gehört die Manta-Baureihe zu den erfolgreichsten Entwicklungen der Unternehmensgeschichte. Mehr als eine Million Exemplare wurden in den Jahren von 1970 bis 1988 verkauft. Autos wachsen. In kleinen, aber unaufhaltsamen Schritten ist aus dem einstigen Kleinwagen Kadett ein veritables Kompaktauto geworden. Das schafft Gelegenheit für Neuerungen. 1982 war die Zeit dafür gekommen, der Opel Corsa stand in den Startlöchern. Nur 3,60 Meter lang und damit klar ein Kleinwagen, konnte die dreioder fünftürige Schrägheck-Limousine dennoch mit einem in dieser Klasse rekordverdächtigen Luftwiderstandsbeiwert von cw 0,36 aufwarten. Und damit Opels Jüngster trotz der knappen Außenmaße stämmig auf der Straße stand, hatte ihn Erhard Schnell, der verantwortliche Designer der Baureihe, mit deutlich ausgestellten Radhäusern ausgestattet. Die waren nicht nur an der Verbesserung der Aerodynamik beteiligt, sie gaben dem Corsa auch eine äußerst erwachsene und robuste Statur. Große Fensterflächen für besten Überblick und eine sanft angedeutete Keilform waren die wesentlichen Charakterzüge des kleinsten Opel, der in manchen Märkten sogar als Stufenhecklimousine mit Kofferraum angeboten wurde. Der Luftstrom des Fahrtwindes wurde für die ausgezeichneten aerodynamischen Eigenschaften „durch die abgeflachte Form der Motorhaube nach oben abgelenkt“, wie es damals hieß. Auch das Tragen von Hüten schien in dieser Zeit noch en vogue zu sein: „Auch bei der Innenraumhöhe beweist der kleine Corsa Größe“, texteten die Schreiber der Presseinformation. „Ihre Kopfbedeckung müssen die Corsa-Passagiere höchstens beim Grüßen abnehmen.“ Erhard Schnell wollte dem Corsa eine ausgesprochen männliche Form geben. Das markante Design war daher von rechten Winkeln und markanten Linien geprägt. All dies sollte dem damaligen Image eines Kleinwagens entgegenwirken. Und mit einem Kofferraumvolumen von 225 bis 845 Liter war der kleine Opel durchaus für den großen Einkauf bestens gerüstet. Als Nachfolger der erfolgreichen Rekord-Baureihe präsentierte Opel 1986 den Omega. In die Entwicklung des neuen Mittelklasse-Fahrzeugs hatte Opel mehr als zwei Milliarden Mark investiert. Das Resultat konnte optisch und technisch mehr als überzeugen. Dank der Erfahrungen, die das Opel-Designteam und die Aerodynamik- Spezialisten bereits 1981 mit der Studie Tech1 gemacht hatten, die seinerzeit die Form des Omega schon verblüffend exakt vorweggenommen hatte, glänzte die neue Limousine mit dem niedrigsten Luftwiderstandsbeiwert ihrer Klasse: cw 0,28. Entscheidend dafür war vor allem die tropfenförmige Gestaltung des Fahrzeug-Grundrisses. Aber auch technisch wegweisende Detaillösungen wie flexible Fugendichtungen, eine flächenbündige Verglasung mit speziellem Führungssystem für die Seitenscheiben sowie versenkt angeordnete Türgriffe und Scheibenwischer trugen ihren Teil dazu bei. Gleichzeitig verringerten die versenkten Wischer im Zusammenhang mit der abgerundeten und stoßnachgiebigen Frontpartie die Verletzungsgefahr bei einem Zusammenprall mit Fußgängern oder Radfahrern. Neben der exzellenten Aerodynamik trug auch eine neuentwickelte Generation schadstoffreduzierter 1,8- und 2,0-Liter-Vierzylindermotoren zu den günstigen Verbrauchswerten des Opel Omega von 6,4 bis 8,4 Liter auf 100 Kilometer im Euromix bei. Auch bei der Gestaltung des Cockpits kamen innovative Lösungen zum Einsatz. Wahlweise war der Omega mit neukonstruierten, leicht ablesbaren LCD-Instrumenten zu haben. Im Jahr 1984 setzten die Opel-Designer und -Ingenieure mit dem Kadett E einmal mehr Maßstäbe. Im Vordergrund seiner Entwicklung stand das Ziel, die Wirtschaftlichkeit gegenüber seinem Vorgänger deutlich zu verbessern. Den Hauptbeitrag dazu sollte die Verringerung des Luftwiderstands bringen – ohne die kompakten Außenabmessungen des Kadett D zu überschreiten. Nach 1200 Windkanalstunden konnte das Entwicklungsteam Vollzug melden. Der Kadett E erreichte – ohne funktionale Nachteile, wie etwa eine starke Innenraumaufheizung durch eine flache Frontscheibe – einen Luftwiderstandsbeiwert von cw 0,32. Übertroffen wurde er nur noch von seiner sportlichsten Variante Kadett E GSi mit einem cw von 0,30. Damit war der knapp vier Meter lange, keilförmige Fünfsitzer, der in der Draufsicht den Tropfen- Konturen ähnelt, die in der Aerodynamik als strömungstechnisch ideal gelten, weltweit das Serienauto mit dem geringsten Luftwiderstand – was die Opel-Presseabteilung damals zu dem schönen Vergleich inspirierte: „Mit seiner Stirnfläche von 1,9 Quadratmetern setzt der Kadett GSi dem Fahrtwind nicht mehr Widerstand entgegen als ein Brett von einem halben Quadratmeter – etwa Großmutters Pflaumenkuchenbrett.“ Zum großen Erfolg des Kadett E, von dem in neun Jahren fast 3,8 Millionen Exemplare gebaut wurden, trug natürlich auch die umfangreiche Modellpalette bei. Insgesamt sieben Karosserievarianten standen zur Wahl: drei- und fünftüriges Schrägheck, drei- und fünftüriger Caravan, Kastenwagen, Stufenhecklimousine und ein elegantes Cabrio. „Schluss mit dem Männlichkeitswahn“ hieß es, als die zweite Generation des Corsa 1993 ihren Vorgänger ablöste. Die scharfen Kanten und Sicken wichen weichen Rundungen und glatten Flächen. Hideo Kodama zeichnete die Form des Corsa B. „Wir wollten damals ein Frauenauto entwerfen, das darf man ja heute gar nicht mehr sagen, das ist diskriminierend, aber es war eben so“, erzählt er von der Aufgabenstellung für die zweite Corsa-Generation. In der Tat waren mehr als 60 Prozent der Kunden, die sich für einen Corsa A entschieden, weiblichen Geschlechts. Diesem Umstand sollte mit der weicheren Formgebung der zweiten Generation Rechnung getragen werden. Die schmalen Dachsäulen erzielten den Eindruck, das Dach würde über dem Innenraum schweben. Diese Ideen waren bei der Konzeptstudie Junior auf der IAA 1983 in Frankfurt am Main erstmals der Öffentlichkeit vorgeführt worden. „Der Corsa B war wirklich ein klarer Schnitt in der Designgeschichte der Baureihe“, sagt Hideo Kodama heute. „Wir haben auf dem im Vergleich zum Vorgänger um zehn Zentimeter verlängerten Radstand ein erheblich besseres Raumkonzept verwirklichen können.“ Platz für bis zu fünf Passagiere und reichlich Gepäck gab es an Bord. „Die Frontscheibe setzte außerdem weiter vorne an und war in deutlich flacherem Winkel positioniert, so dass wir mehr Spielraum bei der Gestaltung des Interieurs hatten“, erklärt Kodama. Der Corsa wurde in der Folge zum Publikumsliebling. Er zählte zu den beliebtesten Kleinwagen in Deutschland und wurde in den ersten 30 Jahren seiner Laufzeit insgesamt mehr als zehn Millionen Mal verkauft. Die Frage, ob der Computer für seine Arbeit immer wichtiger werde, beantwortete Opel-Designer Erhard Schnell mit den Worten: „Der Computer kann nicht kreativ sein.“ Er müsse einen Bleistift in der Hand haben und ihn über das Papier führen können. Das hat er getan, als er dem Opel Calibra Ende der 1980er Jahre seine unverwechselbare Form gegeben hat. Das schlanke, flache Sportcoupé setzte einen Meilenstein in der Design-Historie von Opel. Mit dem Luftwiderstandsbeiwert von cw 0,26 war er bei seinem Erscheinen 1989 das strömungsgünstigste Serienautomobil der Welt – und seiner Zeit voraus. Auf der Basis des Vectra A ist der schnittige Sportler entstanden, die Verwandtschaft sieht man ihm jedoch an keiner Stelle seines gekonnt geschneiderten Blechkleids an. Langgestreckt, mit gerundeten Formen und den wohl flachsten Frontscheinwerfern, die es vor den Zeiten von Xenon-, LED- und Laserlicht gab. Der Calibra war der legitime Nachfolger des Manta. Wie dieser basierte er auf einer im gleichen Segment positionierten Limousine, wie der Manta errang er aufgrund seiner emotional-dynamischen Form bald den Rang eines Kult-Autos. Grund genug, ihn für die Leser der Fachzeitschrift Autozeitung zum gelungensten Sportcoupé des Jahres zu machen. Anfang des Jahres 1991 wählten sie ihn vor den Bewerbern aus Stuttgart und München zum Sportwagen mit dem besten Design unter dem Titel „Formschönes Aerodynamik-Wunder“. Zum Charakter des Calibra stellte Erhard Schnell noch Jahre später fest: „Eckig wird es vorerst nicht mehr. Ich selbst finde die runde Form auch angenehmer, sie wirkt substanzieller. Zu viele Knicklinien wirken optisch leicht instabil“. Basierend auf dem Corsa B hat der japanische Opel-Designer Hideo Kodama die Gestalt des kompakten Sportcoupés Tigra entwickelt. Der 2+2-Sitzer wird anders als die Corsa-Limousine von ausgeprägten B-Säulen, einer Motorhaube mit markanten Sicken und einem kuppelförmigen Glasdach über dem Heck geprägt. „Bei einem Coupé zählen nicht nur die strengen Maßstäbe der reinen Vernunft“, heißt es im Begleittext des knapp vier Meter langen Zweitürers. „Hier sind Emotionen erlaubt, ja sogar ausdrücklich gewünscht.“ Das in Amerika entwickelte, getönte Sundym-Glas der Heckhaube senkt die Temperatur im Innenraum um vier bis fünf Grad, folgt also nicht nur ästhetischen Gesichtspunkten, sondern erfüllt auch jegliche Ansprüche an die Funktion. Der Innenraum ist variabel, was damals bei Coupés eine seltene Eigenschaft war. Hideo Kodama erklärt die Funktionalität: „Wer ein kleines Auto fährt, tut das wegen des günstigen Preises oder weil er in der Stadt nicht unnötig lang nach Parkplätzen suchen will. Dabei ist das Auto für ihn nicht nur ein attraktives Fortbewegungsmittel, das ihm unterwegs Fahrspaß bereiten kann, sondern auch ein Transportmittel. Damit nichts zu Hause bleiben muss, kann der Laderaum des Tigra dank der klappbaren Rückbanklehnen den Bedürfnissen angepasst werden.“ Beim Tigra hat Kodama aus diesem Grund weiche und harte Designelemente einander gegenübergestellt. Die sanften Rundungen stehen als Kontrapunkt zur ausgeprägten Keilform des Sportcoupés, die scharfen Sicken der Motorhaube korrespondieren mit den weichen Radien der Lufteinlassöffnungen im vorderen Stoßfänger. 1994 startete die Produktion des flinken Opel-Coupés, sie endete im Jahr 2001. Am 16. April 1999 ging mit dem Opel Zafira ein echter Trendsetter an den Start. Der Nachfolger des Sintra auf Astra-Basis überzeugte mit klarer Linienführung und technisch orientierter Formensprache, die das Konzept des Kompakt-Vans – hohe Funktionalität und Variabilität sowie ein großzügiges Raumgefühl – sofort verdeutlicht. Einzigartig wurde der Zafira aber durch sein innovatives Flex7-Sitzsystem, mit dem sich der kompakte Siebensitzer kinderleicht in einen Zweisitzer mit einem 1700 Liter fassenden Laderaum verwandeln ließ, ohne dass dafür Sitze ausgebaut und außerhalb des Fahrzeugs gelagert werden mussten. Die Einzelsitze der dritten Reihe konnten mit einem intelligenten Faltmechanismus zusammengeklappt und in Mulden im Fahrzeugboden verstaut werden, so dass eine ebene Ladefläche entstand. Für noch mehr Transportvolumen konnte auch die zweite Sitzreihe zusammengefaltet, nach vorne geschoben und hinter den Vordersitzen fixiert werden. Doch der Zafira war keineswegs nur ein Lastesel. Er überzeugte ebenso, dank seines neu abgestimmten Fahrwerks, mit seinem Pkw-ähnlichen Fahrverhalten, dem mit cw 0,33 besten Luftwiderstandsbeiwert seiner Klasse und einem Leergewicht von lediglich 1390 Kilogramm, das deutlich niedriger war als bei vergleichbaren konventionellen Familien-Vans. Die letzten beiden Werte trugen maßgeblich zur hohen Wirtschaftlichkeit des Opel Zafira bei, der mit seiner 100 PS starken Einstiegsmotorisierung lediglich 8,3 Liter auf 100 Kilometer verbrauchte. Neuland betrat Opel im März 2001 mit dem Speedster. Der offene, zweisitzige Sportwagen war das erste Mittelmotorauto der Marke mit dem Blitz und gleichzeitig das erste Opel-Serienfahrzeug, das aus Aluminium und Kunststoff gebaut war. Der gerade mal 3,79 Meter lange und 1,12 Meter flache Flitzer basierte auf dem Grundkonzept des Lotus Elise. Aber die Fahrmaschine war auf Anhieb als Opel zu erkennen. Denn, wie Opel-Designchef Hans Seer seinerzeit erläuterte: „Die Leichtbau-Karosserie setzt die technisch orientierte Formensprache, die wir mit den Studien G90 und Zafira Snowtrecker gezeigt haben, erstmals in die Serie um.“ Dabei nutzte das Speedster-Designteam die Möglichkeiten, die das Material Kunststoff bot, und formte radikale Kanten, deren Umsetzung in Blech nur sehr aufwändig realisierbar gewesen wäre. Aluminium, das die Struktur des Speedsters bildet, steht auch im schnörkellosen Innenraum im Vordergrund. Angetrieben vom 147 PS starken 2,2-Liter-Ecotec- Motor aus dem Astra Coupé beschleunigte der 945 Kilogramm leichte Speedster in nur 5,9 Sekunden auf Tempo 100. Noch temperamentvoller war der Speedster 2.0 Turbo, der 2003 auf den Markt kam und den Sprint auf Tempo 100 in nur 4,9 Sekunden meisterte. Seine Höchstgeschwindigkeit betrug 243 km/h. Beim Vergleichstest der englischen Fachzeitschrift Car siegte der Opel Speedster 2003 gegen 38 Supersportwagen und gewann damit den Titel „Performance Car of the Year“. Auf der Internationalen Automobilausstellung (IAA) in Frankfurt am Main feierte der bis dato aufregendste Opel Astra aller Zeiten 2011 seine Weltpremiere – der GTC. Das Gran Turismo Coupé begeistert mit seiner emotionalen Ausprägung der neuen Opel-Designphilosophie. Mit seiner sportlichen Silhouette mit der schwungvoll gebogenen, niedrigen Dachlinie, seinen sportlichen Proportionen und der ausgeprägten Pfeilung von Front und Heck wirkt er wie zum Sprung geduckt. Betont wird dies, indem der Astra GTC tiefer als seine „braven Brüder“ auf dem Asphalt kauert. Besonders deutlich wird der dramatische Auftritt mit der auf Wunsch bestellbaren Panorama-Frontscheibe. Dieses neuartige Scheibenkonzept aus Solar-Protect-Glas erstreckt sich bis zur B-Säule und vermittelt ein völlig neues Seh- und Raumerlebnis, vergleichbar nur mit der Pilotenkanzel in einem Sportflugzeug. Ein cleveres, stufenlos verstellbares Beschattungssystem schützt die Insassen vor zu starker Sonneneinstrahlung. Zugeständnisse an die Sportlichkeit des GTC müssen die Passagiere ohnehin nicht machen, denn obwohl die Seitenscheiben im Fond stark eingezogen sind, reisen auch dort Erwachsene komfortabel.